Two painted pottery horse torsos, each with a rider. The well-modelled horses have four slots in the base where separate legs can be inserted, as well as slots for the ears and the tail. The back has a small hole for fixing the rider. The horses are brightly painted with fully detailed harnesses, lozenge patterns on the bodies and a black mane. The riders wear double robes with black belts; on one rider the outer robe has a lozenge pattern in green and red pigments and he wears white boots; on the other rider the robe has a scale-pattern in purple on a black ground and he wears purple boots. Their heads are fitted with tight black caps, which are held by a red strap. Their facial features are painted in great detail. The practice of placing pottery models of horses in a tomb started from the Qin dynasty (221 – 207 BC) and became more widespread during the Han dynasty, particularly as a result of the Han people’s ongoing struggle against the Xiongnu, a tribe of formidable horsemen originally based in the Ordos region of present-day Inner Mongolia. The riders’ armour is composed of ‘metal‘ scales, as usually worn by officers, rather than the larger square plaques worn by common soldiers. 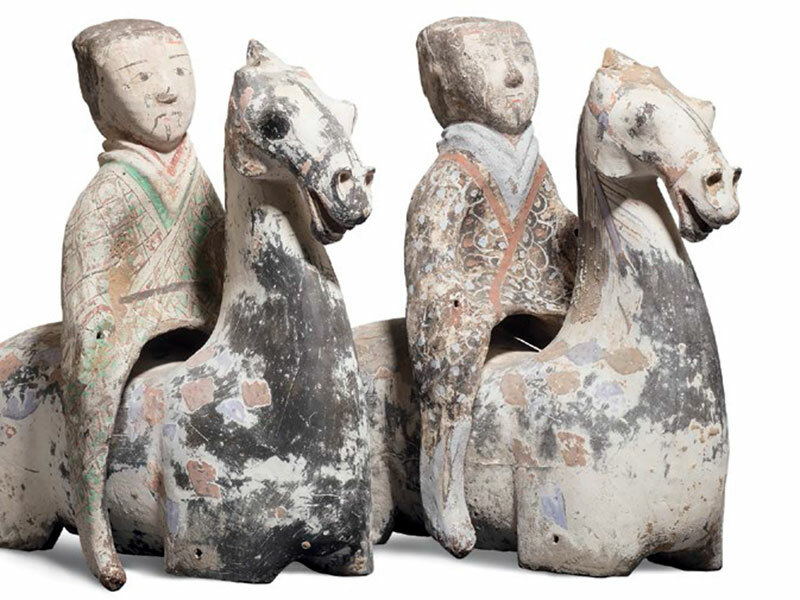 The bright purple pigment painted on the horses and riders is often found on Han pieces, together with bright green, bright pink, and bright blue. Three closely comparable Western Han pottery horses with riders, painted in similar colours and patterns, were excavated from the tomb of an important feudal lord in Shandong province and are illustrated in Horses for Eternity. Horses from the Shandong region are distinguished by flamboyant surface decoration in the form of bright pigments and by the absence of legs. The underside of the body has sockets for the insertion of wooden legs, which have disappeared completely. Those similar characteristics indicate that the current examples might have come from the Shandong region as well. 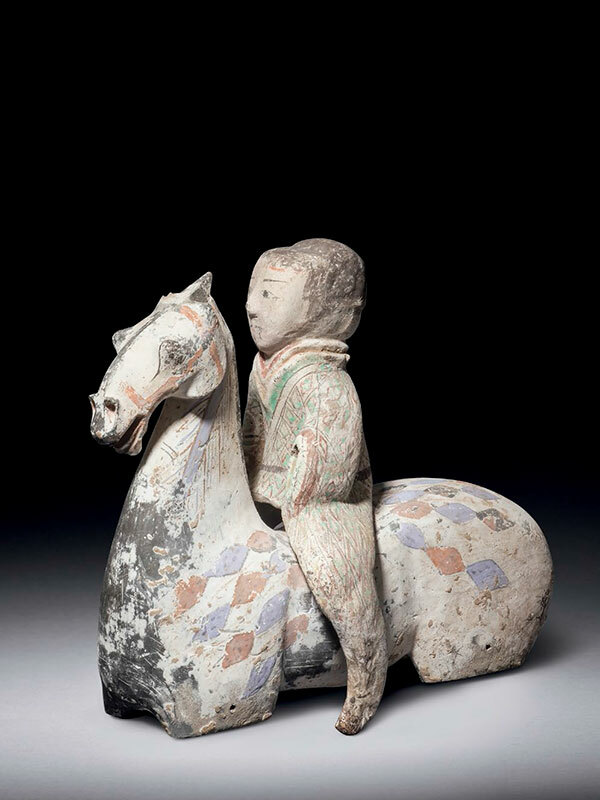 Another pair of pottery horses and riders, of similar size and dated to the Western Han dynasty, is in the Julius Eberhardt collection.